Steel twin screw motor vessel, built in 1965 by Ateliers et Chantiers de la Seine-Maritime, LeTrait, France (Yard No. 173), for Stena Ab, Göteborg as a passenger and vehicle ferry. September 23rd 1964: Keel struck. July 1st 1965: Arrived in Calais for berthing trials. July 1st 1965: Sailed to the Pool of London. 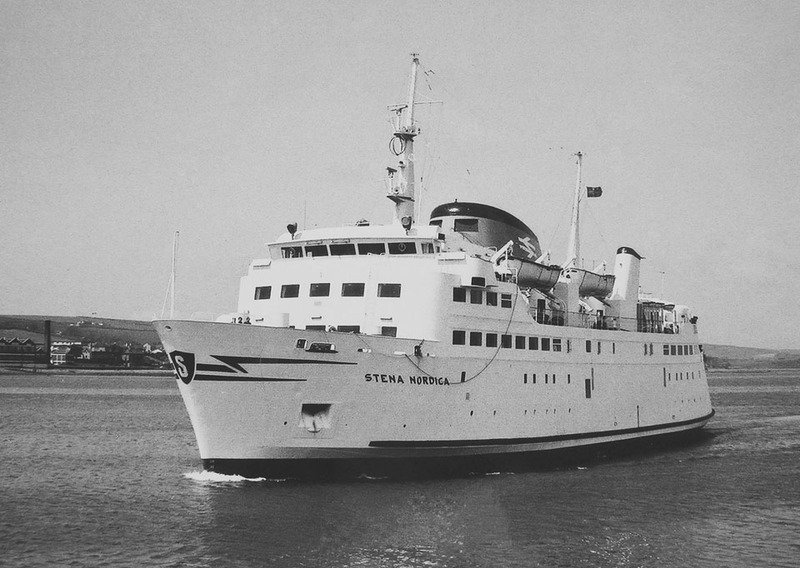 July 1st 1965: Delivered to Stena Ab, Göteborg. 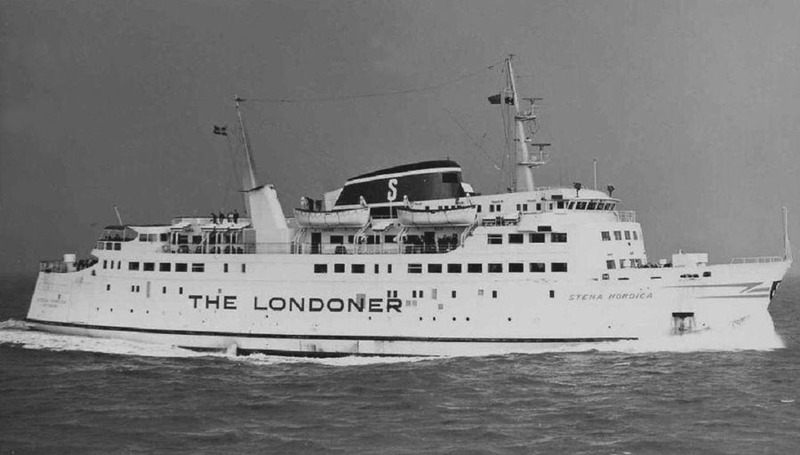 July 3rd 1965 – October 3rd 1965: Operated daily round trips (also provided a London – Paris coach/sea/coach service) between London (Tilbury) – Calais. 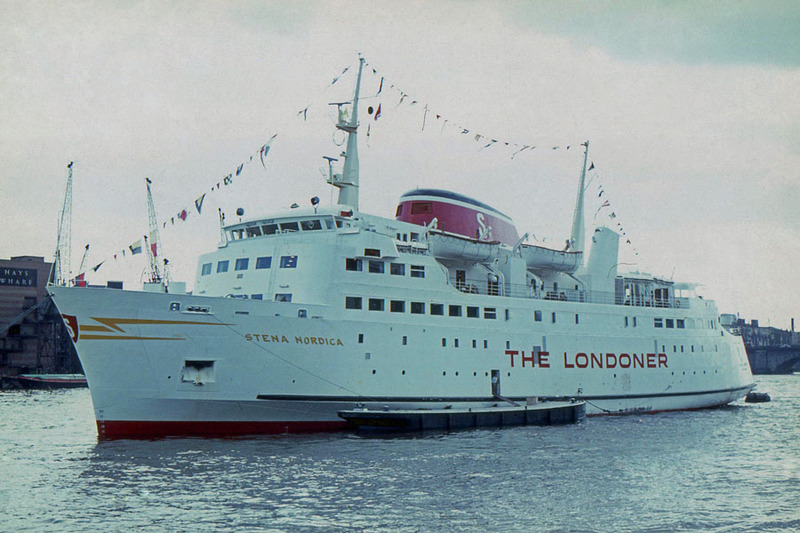 Although her offiicial name was STENA NORDICA she sported, in big letters, on her hull sides, THE LONDONER. 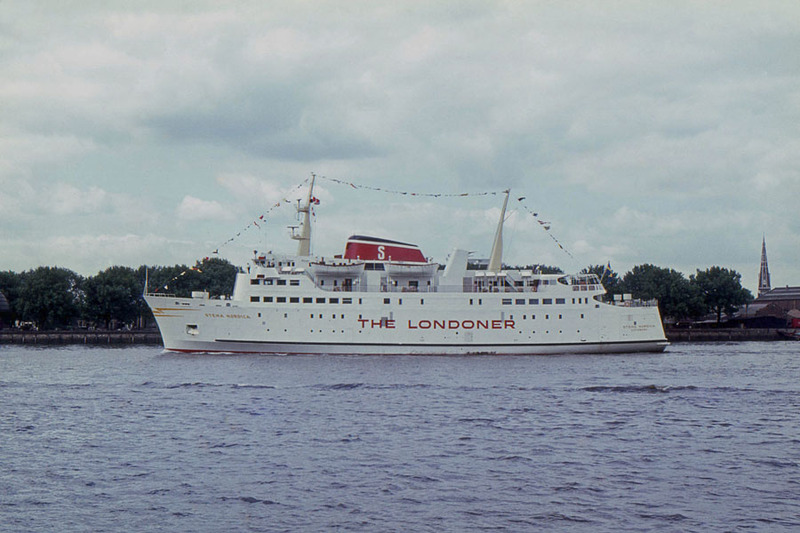 July 7th 1965: She was formally inaugurated in Calais. 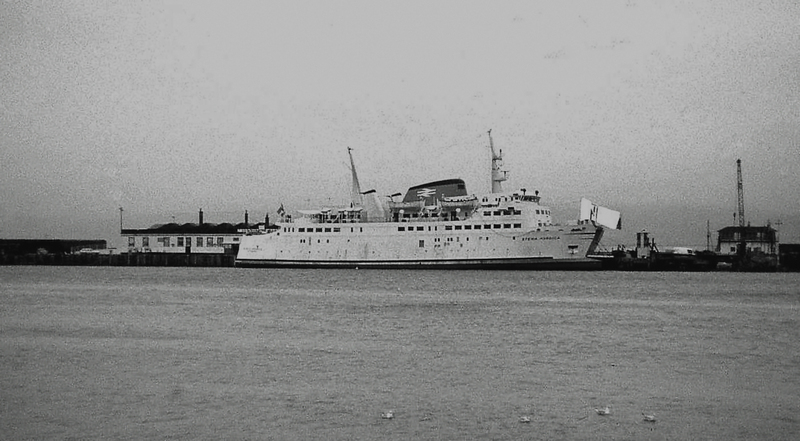 October 11th 1965 – December 23rd 1965: Operated between Stockholm – Mariehamn, trading under the name JÄTTEN FINN. January 28th 1966: Bare-boat chartered to Caledonian Steam Packet, Co (for two years, extended to five). Built as a one-class ship, she operated as a two class while at Stranraer. January 1966 (late): Arrived at Stranraer for berthing trails, then to Larne for trials. February 14th 1966 – April 25th 1968: Operated between Stranraer – Larne daily. Summer twice daily. Swedish operating crew with Irish purser staff and stewards. 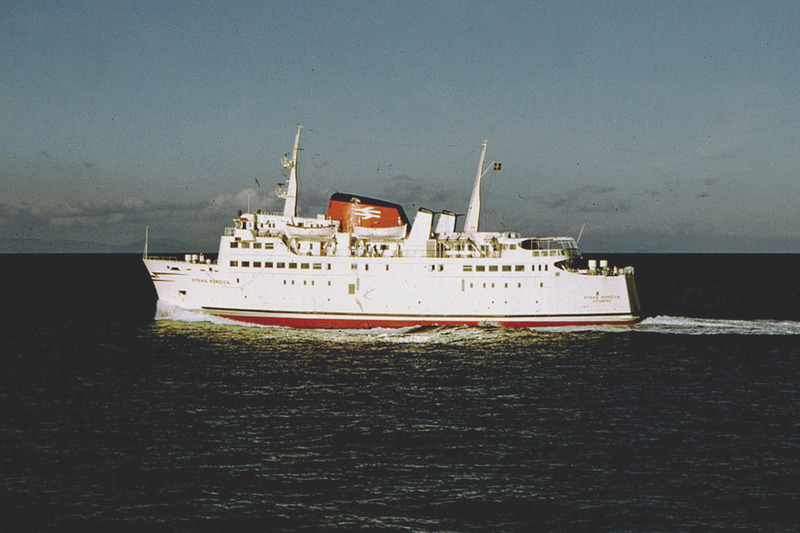 1967: During winter overhaul painted in BR livery (white hull/red funnel with white double arrow). April 26th 1968 – June 14th 1968: Laid up in Queens Dock, Glasgow. 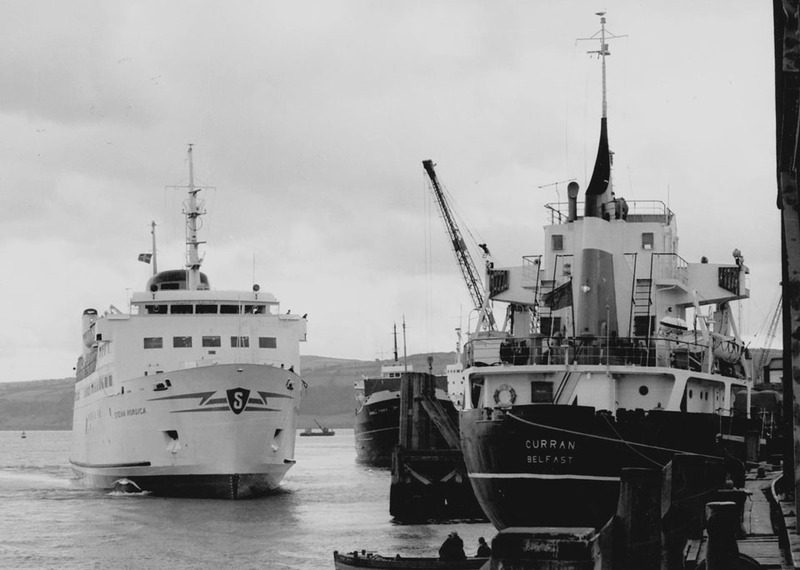 June 15th 1968 – September 17th 1968: Operated Stranraer – Larne (November, annually to overhaul at Greenock). September 18th 1968 – October 28th 1968: Laid up in Glasgow. October 29th 1968 – December 18th 1968: Operated Stranraer – Larne. December 19th 1968 – February 20th 1969: Laid up in Glasgow. February 21st 1969 – October 26th 1969: Operated Stranraer – Larne. 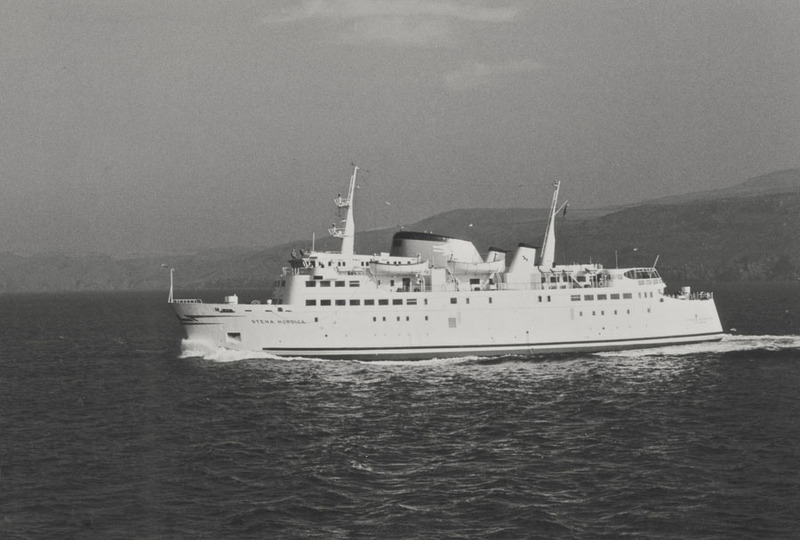 October 27th 1969 – October 30th 1969: Bareboat chartered to Burns & Laird to relieve LION on Ardrossan – Belfast service. 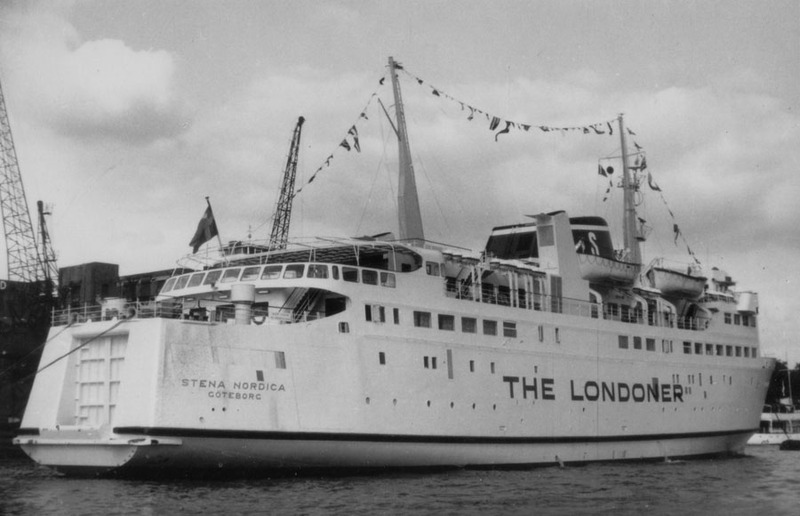 November 1st 1969 – December 10th 1969: Operated Stranraer – Larne. December 11th 1969 – February 6th 1970: Laid up in Glasgow. February 7th 1970 – October 1st 1970: Operated Stranraer – Larne. October 2nd 1970 – October 10th 1970: Bareboat chartered to Burns & Laird. Operated Ardrossan – Belfast. October 11th 1970 – March 27th 1971: Operated between Stranraer – Larne. Part of the time operating from Ardrossan until the newly installed car ramp at Stranraer was re-positioned after sinking. March 27th 1971: Charter completed. March 28th 1971: Returned to her owners. May 1st 1971 – June 9th 1973: Operated Gothenburg – Fredrikshavn. June 1973: Sold to Naviera Nueva Esparta S.A., Caracas, Venezuela. (Mgrs. Dr. Rafael Tovar, Caracas). Renamed SANTA ANA. 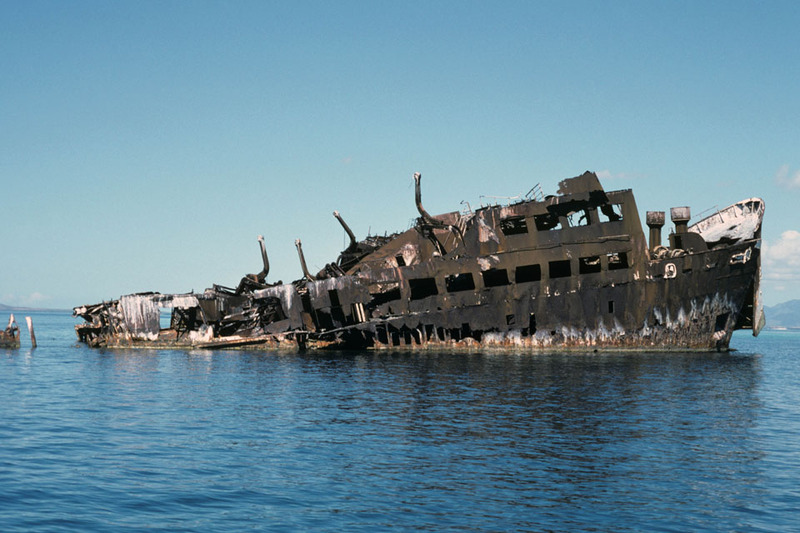 August 1973: Operated between Puerto La Cruz – Punta de Piedras. 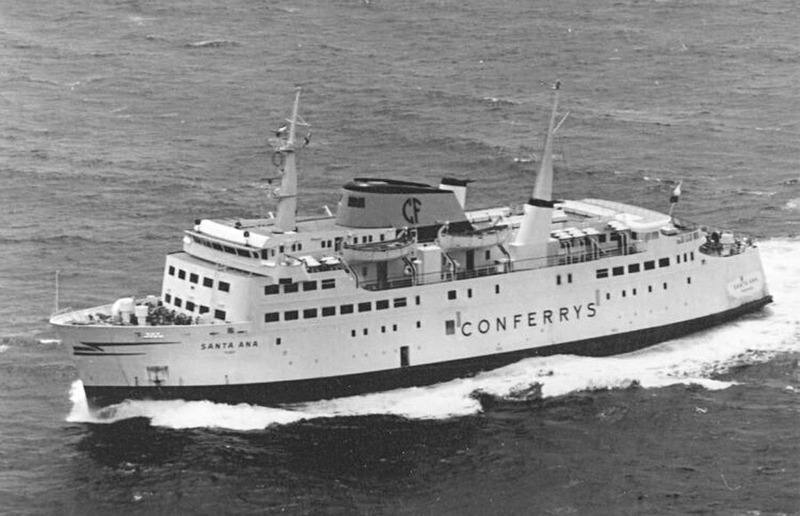 1975: Sold to Consolidata de Ferrys C.D, Caracas, Venezuela (Conferrys) with three ships. Operated La Guayra – Cumana and Cumana – Margarita Island. 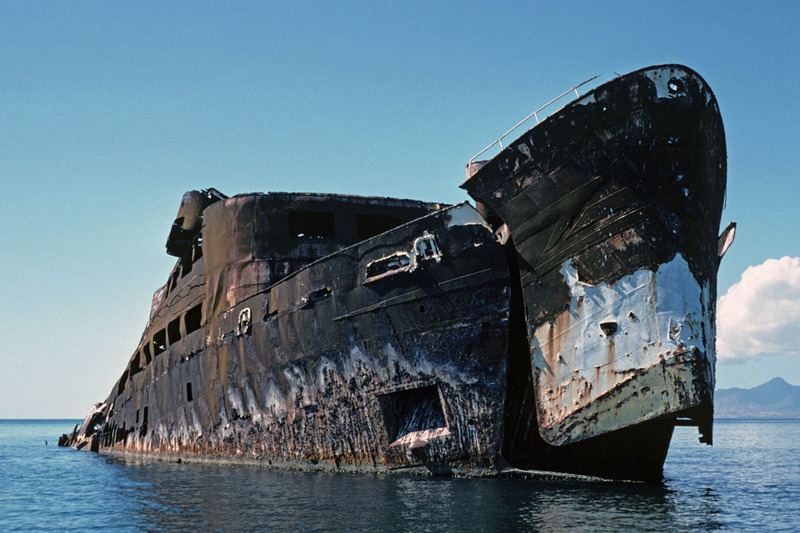 May 7th 1980: Near Puerto la Cruz fire broke out in her engine room and was gutted. Although taken in tow the ship ran aground and sank in position, 10,5N. 64,10W. She has never been raised. We would like to thank: Frank Heine, Justin Merrigan Frank Phillips and Andreas Wörteler for their assistance in producing this feature. All information is believed to be correct and no responsibility is accepted for errors and omissions. Special thanks goes to Ian Collard, Jim Ashby and the World Ship Society (East Kent Branch).